In the heart of downtown Los Angeles, lives a beautiful office building with an absolutely stunning space on the 25th & 26th floors. Built in 1982, the 26-story building encompasses an entire city block and has more than 700,000 square feet of office space. When new tenants, CBRE Global Investors bought the building in 2012, they decided to locate their global headquarters in the atrium-like 25th and 26th floors. The space was laid out in a tiered mezzanine configuration with huge sloped skylights that provided fantastic views of the downtown area. Unfortunately, the same windows that made this space so spectacular brought along with them some serious problems. When John Bonomo, CBRE’s Director of Operations, spoke to previous tenants, he found that they had some serious complaints about the space. Massive heat gain through the skylights made it hard to keep cool and beyond that, there was a huge issue with glare from the direct sunlight. 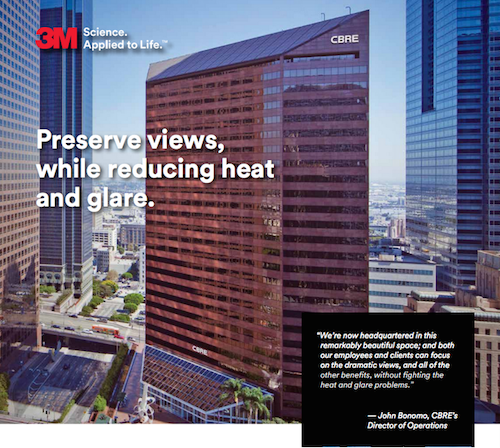 Luckily, CBRE, had a great deal of experience with a product specifically designed to address the issues: 3M Window Film. Several options were considered to combat the problems the sunlight was creating. 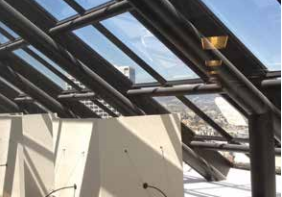 They considered installing window shades, but the sheer size of the space – 11,000 square feet of glass – plus the possibility of breakage and repair coupled with high maintenance cleaning needs ended that plan. Window tinting provided a maintenance-free solution. They used 3M Sun Control Window Film Night Vision 15 window film. This window film would reject the heat, block the glare and preserve the beautiful views that the architects had in mind when the space was originally designed. It was the perfect solution to this commercial building window problem. At Tintmaster, we trust 3M window films every day to solve all of our customers’ problems with heat, glare, fading, and more. From commercial buildings, to residential homes, to automobiles, RVs, and boats, we can help. Give Tintmaster a call at (916) 852-8468 and we’ll provide the right window tinting solution for you!